Note: This was a “silent update” pushed out to the Ryver servers. Please select View > Reload in the Ryver desktop app, or refresh your browser tab. Please also make sure you have the latest mobile build from the appropriate mobile app store. Ryver organization administrators, please refresh/reload your Ryver client to gain access to the task manager Upgrade! option. For more on upgrading to Ryver Task Manager, and information on the pricing tiers, check out our Sneak Peek web page. We will have a more public launch, and a new Ryver website in a couple of weeks. Turn your conversations into action with the new Ryver Task Manager! 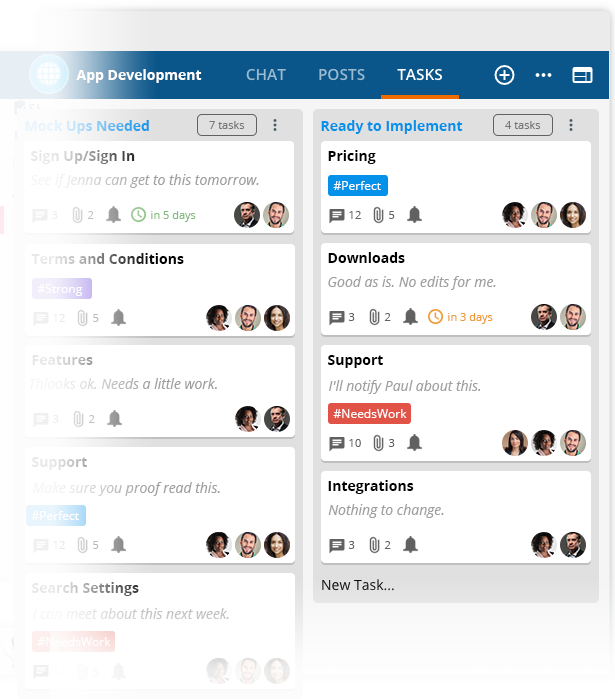 Last week, we introduced personal tasks, available for free to all users. Now we have completed the private beta for team-based collaborative task management, and we are offering a free 14 day trial to all current customers! Fixed issue where personal tag auto-complete would show up when doing 1:1 messages and typing #. Adding an Avatar to a team/forum from the edit view should now work. Clicking on a link to a task from a post/comment works again.